You currently have 0 loyalty points! This is a coupon for the Little Pim online store. 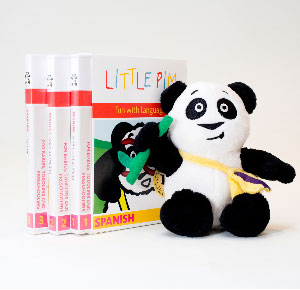 Teach your kids a foreign language with Little Pim! Fun With Languages is a fun award-winning foreign language immersion DVD series designed for babies, toddlers and preschoolers. The DVDs are available in French, Spanish, Chinese, Italian, Hebrew, Japanese and English/ESL for Spanish Speakers. Scientific research confirms the benefit of introducing your children to a second language before the age of 5. Now there is an easy, fun, and affordable method specifically designed for babies, toddlers, and preschoolers: Little Pim. Little Pim is a fun award-winning foreign language immersion DVD series created by filmmaker and mother, Julia Pimsleur Levine, daughter of Dr. Paul Pimsleur, creator of the best-selling foreign language learning method. There are several brands on the market to teach foreign language to children, but Little Pim is unique in its focus on babies, toddlers and preschoolers; its high quality entertainment, and its breadth of languages. The Little Pim method uses entertainment and immersion, and engages with a young child's natural love of repetition. Children bond with the lovable animated cartoon panda bear, Little Pim, who is the series "teacher." He invites young viewers to join him in his playful antics as they learn the language along with real children enjoying everyday activities. Each Little Pim DVD focuses on sixty words and phrases typically acquired in a toddler's primary language. Watch Little Pim with your little one and learn and/or repeat the words together - it's fun for kids and adults! Little Pim is currently available in seven languages: French, Spanish, Chinese, Italian, Hebrew, Japanese and English/ESL for Spanish Speakers. In addition to the DVDs, Little Pim will soon be offering flashcards and music CDs. To learn more about Little Pim, visit their official website here. You can also submit a support ticket by clicking here.